OK, that song has not much to do with the recipe, except that when it comes to making Tomato Chutney, there are more ways than one. I will be presenting the version which I learned at my mother's knees (I can hear my Mom saying, Hrmmm...). 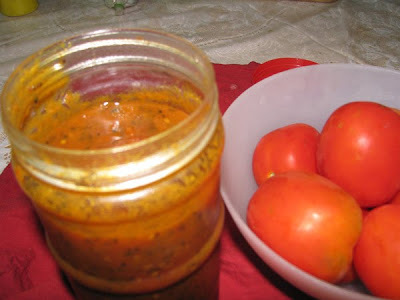 Tomato chutney is a doyen of Bengalee chutneys among with a host of other bright stars in the firmament, like raw papaya chutney and Mango chutneys, which I will add by and by. There are fond memories associated with the first time I made it. You could say, it was my first solo run in cooking. When my friends took a house (and a cooking stove) along with their first salaried jobs, some lucky, few hangers-on used to regularly join them over the weekends and try our hands at cooking. 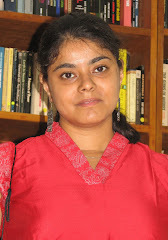 Those were heady days! The tomatoes were carefully selected for their glossy redness, and the chutney lovingly made; always in bulk! As it simmered, it filled the house with a gorgeous smell. The aroma is a perfect marriage of fresh chilli, ginger and the panch phoron. I just have to taste it along the way while its cooking. Its sweet, sour and finger-licking; indeed this version is quite sticky. Begin by assembling all the whole spices and grating the fresh ginger and slicing the green chilli. Cut the tomatoes into quarters and maybe even a little thinner depending on size. Heat the oil in a large kadai/wok. Before it starts smoking, add all the whole spices. Let them splutter, which they should do within seconds. Add the ginger and the chopped chillis. Saute them until an intense aroma comes off; about 3 minutes over low heat. Add the tomatoes. Coat with the spice mix thoroughly. Stir a few times. Add the salt and turmeric and mix in again. Let the tomatoes cook for 5 minutes then add the sugar. Thoroughly stir it until the sugar is completely dissolved. At this stage, you can cover it and leave it to its own devices for about 10 minutes at the lowest flame. 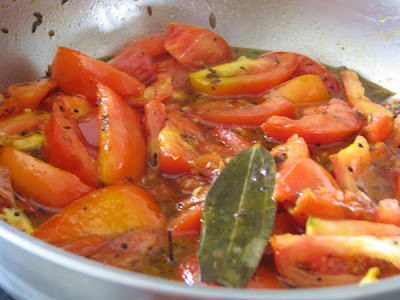 The tomatoes will release copious amounts of water and will gently simmer and soften. Take off the lid and check how much liquid is present as well as the firmness of the tomatoes. The skin should be flaying off and the flesh soft. If not, cover and give it another five minutes. Taste it. It should be sweet but not over-cloyingly. Add a little bit of salt if necessary. Now increase the heat and stir. The liquid has to be reduced until it is leaving a red streak on the ladle when you spoon into it. There's a personal element here; my family like it thick. Remember that the chutney is going to congeal more as it cools. The chutney must be stirred all the time at this stage, so that it doesn't stick. Its hot work, but worth it! Should take about 10 minutes on medium heat. Taste it once more. Shut the burner and add the dates and raisins. Mix them in. By this time the chutney should have cooled slightly. Add the lime juice. Add half of it first, let it be completely incorporated and then add according to taste. How much is needed depends on the sourness of the tomatoes too! The sour and sweet must balance each other. Let it cool down completely (this takes time) before bottling it in sterile container(s). I usually boil my jars in water for 10 minutes before drying them in the oven at 200 degrees for 10 minutes. The distinctive aroma of Bengalee dishes is frequently due to this spice blend made of five whole spices. Like all great things, it can lift the mundane to new heights! This is the combination of the store bought stuff. Needless to say, every home has its variants in amounts as well as in spices! Its best to make it in small quantities since it goes musty quite fast. Combine all spices in a heated kadai, roast for about 10 seconds while stirring it, cool and store away from heat and light in a jar.